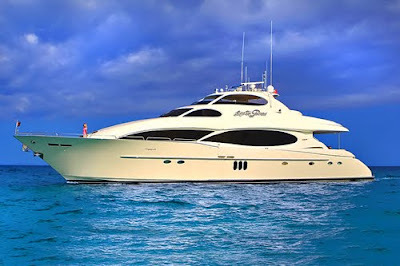 After a major refit in 2009, 106' Motor Yacht, Stop the Press is available for charters in Florida. Master Stateroom: Below Amidship: Walk-around king bed with Tempur-pedic mattress, his and her heads, shower and Jacuzzi tub. Crestron Entertainment center with 42” Sony Plasma TV/DVD/CD. Large walk-in closet, additional “his” closet vanity and dresser. VIP Stateroom: Forward: Queen bed with ensuite head and shower. Built in settee, 32” Plasma TV with DVD/CD player. Guest Stateroom: Below Port: Large Double bed with ensuite head with tub and shower. 17” LCD TV with DVD/CD player. Guest Stateroom: Below Starboard: Double bed with ensuite head and shower. 17” LCD TV with DVD/CD player.